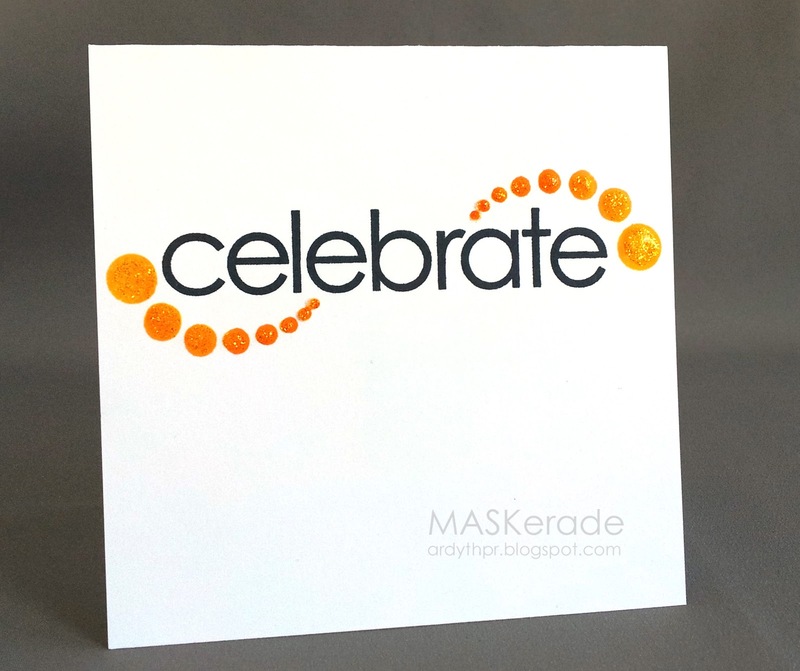 MASKerade: Muse #82 - Celebrate! I just love the swirls of bright dots (I think they look like fireworks on the dark background!) but of course I also love my white space! I used an old Stampin' Up sentiment and an (I think) Inkadinkado or Stampendous swirl stamped using Desert Heat Kaleidecolor ink. I then added some Diamond stickles for sparkle. I love that this one-layer card is simple, but fun and celebratory, just like Bobby's! I know it's a busy time of year (lots of kids going back to school!) but I hope you'll get a chance to play along - the deadline is next Monday at 8 am EDT. At that point you can vote for your favourites until Tuesday morning at 8. Results of the voting will be posted on Tuesday at noon. So so cool. Love the curves. Simply brilliant Ardyth - that stamp is just like one in PTI's Grunge set...I really must try and join in at Muse more often! Too many challenges..too little time! Beautiful take on the challenge, love it! Sparkly curve of gold dots...in love! Fabulous card, Ardyth - and I'm wearing my play-along thinking cap! Love your clean, crisp interpretation! Fabulous movement! This rocks! Love the way those swirls hug the sentiment and the sparkle is perfect! Wow. I love how your dots transforms your sentiment Ardyth. Gorgeous take :) love it! Awesome card! Love the color, fabulous design and gorgeous sparkle! Great movement on this card Ardyth, I love it! Love the colors and movement on this CAS beauty, Ardyth! As always, beautifully done! The large black sentiment and lovely swirled dots are a wonderful take on my card. Just gorgeous, Ardyth... fresh, dynamic, YOU! I just adore how you used the inspiration card, Ardyth! This is fabulous!